Join me for the public opening block party/celebration of Salesforce Transit Center. During this opening party event, I will be putting the finishing touches on a huge mural that is 10 feet high x 40 feet long. I have a 3 days to paint this mural starting this weekend. I’ll finish the mural on Sat August 11th. Here’s the days painting session on the wall at Salesforce!! This is cool!! Mural is not finished yet but I have one more day to get it done! 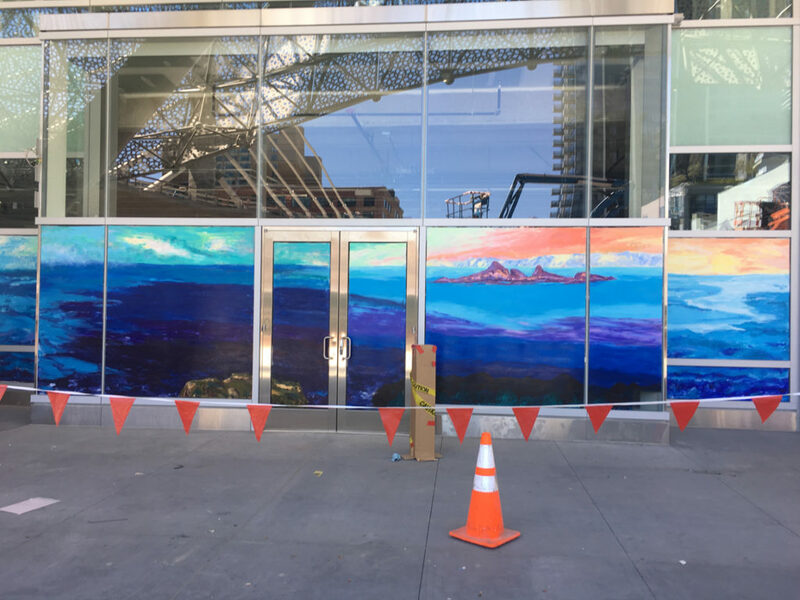 Marius Starkey – Transbay Terminal Mural Project. from Brian Ashby on Vimeo. Artist Marius Starkey will paint en plein air inspired by the works of J.M.W. Turner in the de Young’s Osher Sculpture Garden.Marius Starkey responds to the sublime beauty of the light, sky, and trees surrounding the garden using a variety of canvases. Visitors are welcome to draw alongside Marius while the sun sets or the fog drifts in. Friday Nights at the de Young are after-hours art happenings that include a mix of live music, dance and theater performances, film screenings, panel discussions, lectures, artist demonstrations, hands-on art activities, and exhibition tours. Local artists conduct drop-in workshops, debut new commissions, display their art in the Kimball Education Gallery, and take part in conversations about the creative process. The Café offers a delicious prix-fixe menu and specialty cocktails, and the Hamon Tower observation level is open until 8 pm. Artists-in-Residence, curators, scholars, and arts educators play active roles in making Friday Nights an engaging museum experience. You can find out more about the event here. And here’s what else is happening that day. And here’s the link to Google Maps. Please join me to view a major show of my paintings titled “The Ocean Series,” in Mission Bay at the UCSF Sandler Neuroscience building. The show celebrates our deep emotional and physical connection with the ocean. 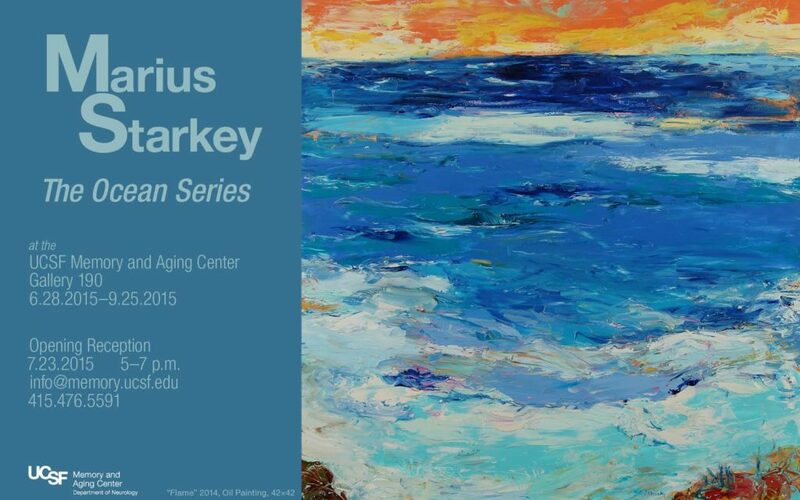 The show is in the UCSF Memory & Aging Center, Gallery 190 (room) and it is located on the lobby. June 28th to Friday, September 25th, 2015 and open to the public 9am–5pm weekdays excluding holidays. **Upon arriving, please check-in at the security desk. Pay parking at Mission Bay Campus is a very short walking distance from the show. · 1835 Owens Street Garage – located across from Mission Bay Hospital. · 1630 Third Street (multiplex) Garage – located just (1/3 block) North of 16th Street. · Fourth Street Surface Lot – Forth Street, just north of 16th Street. An exhibition of my new large paintings is open to the public at Supervisor Scott Wiener Office in San Francisco City Hall durning business hours until February 2015. Supervisor Scott Wieners office is on the second floor of City Hall. I’ll be showing some of my latest works during the Open Studios at Hunters Point Shipyard. , Free abundant and secure parking. 819 Bridgeway, Sausalito, CA 94965. How to get there? Here’s the link to Google Maps. I am one of eight artists chosen to paint one of the large Hearts for the San Francisco General Hospital. The Hearts are 5 ft tall, weighing 400 lbs. They are auctioned off to the top bidders. Here is a little from their web site. The presentation will be on Feb 13th 2014 at AT&T Ball Park with all Hearts on the baseball field. I’ll be at the event! 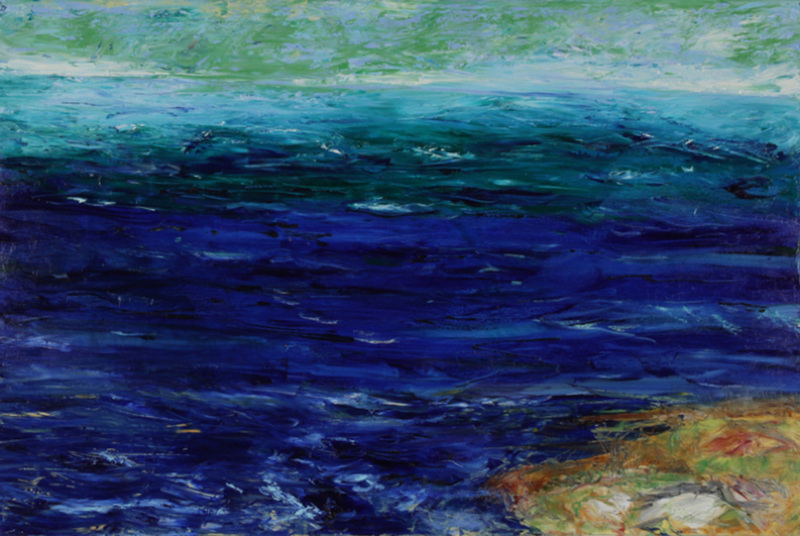 I will be painting live in at the Legion of Honor in celebration of their current show “Impressionists on the Water“. The show includes 80 paintings by Impressionists such as Monet, Renoir, and Pissarro. On Oct 6th and Oct 13th 2013 I’m showing my paintings at the Legion of Honor and I will be working in a like manner of these amazing painters in three different mediums. Tickets are available here at the Legion of Honor website.